"Latitude and Longitude Bracelet Silver, Where Our Love Began Bracelet"
L♥ve blooms differently for everyone. Commemorate the location where you met your love with this stylish, simple bracelet! 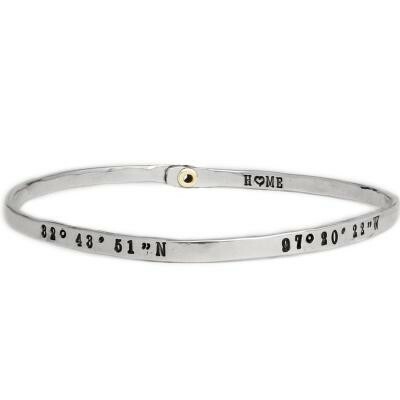 Create a personalized bracelet stamped with the location's latitude and longitude. The inside will have one simple word, L♥VE. In addition, a simple bronze heart can be added as a special extra touch of love. This stylish, simple bracelet that holds so much of what is meaningful to you - the location of where you met the love of your life. We will stamp the coordinates of the location on the outside and on the inside will be stamped with the word L♥VE. In addition, a simple bronze heart can be added as a special extra touch of love. On the inside we stamp L♥VE unless you tell us in the comments section you want something else. Max characters for inside stamp is 9.